Solar becoming essential for business profitability | West Coast Solar, Inc.
Not too long ago, major corporations would install solar panels on the rooftops of their facilities in order to earn the good graces of environmentalists and renewable energy advocates. It wasn’t so much that the companies wanted to save money as they wanted to send a message that they cared about the environment, earning public relations credit but little else. Now that solar power is an affordable and valuable asset for both homeowners and businesses, many of these corporations are investing heavily in their own solar generating infrastructure in order to make their firms more sustainable. The Solar Energy Industries Association (SEIA) recently released a list of the top 25 solar companies in the United States, and many recognizable names show up at the top. 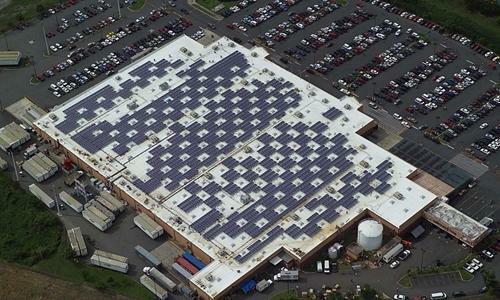 Leading the way is Wal-Mart, which collectively has 89.5 megawatts (MW) of solar generating capacity providing power to its thousands of stores. To give some context to that number, 89.5 MW represents about 35 percent of the capacity of California’s largest photovoltaic solar plant, the California Valley Solar Ranch. In other words, it is a massive amount of solar power. Behind Wal-Mart are retailers Costco (47.06 MW) and Kohl’s (44.72), and rounding out the top five are Apple, Inc. (40.73) and Ikea (35.08). SEIA states that total commercial deployment of solar energy throughout the United States in 2013 was 3,380 MW. The reason that companies are adopting solar power is the same reason that homeowners have found this technology so enticing: Solar energy provides enormous value and savings that can free residents and business owners from high electricity bills. For more information on the benefits of solar, contact West Coast Solar today.